On January 3rd, 2009, I landed in Cairo beginning what have become the most critical and formative years of my life. At twenty-two, I spoke nearly no Arabic, had nowhere to stay, and hadn’t the slightest idea what I was going to do for work. I was, however, brimming with hope, excitement, and enthusiasm for getting to better know Egypt and the Arabic language. Stepping off the airplane on that January evening and taking a cab to a hotel downtown, I couldn’t have known on what sort of journey I was embarking nor for how long it would last. I studied abroad in Cairo in the summer of 2007. Then, like later, I was exceedingly excited for the prospect of visiting and exploring a new country, one which occupied my imagination since childhood but about which I knew very little in reality. I landed anticipating the old clichés: minarets and pyramids, camels and dust. I realize now how completely my expectations were colored with orientalist hues; some of which have been dislodged but admittedly many remain. The dust, however, was and is very real. My summer was much more than seeking picturesque postcard backdrops. For the first time in my life, I was completely immersed in a cultural setting so unlike anything I had ever known. I was forced to confront my own biases and prejudices, reexamine my thinking, and resituate my own position within the broader world around me. And, critically, I was confronted with poverty for the first time in my life. That experience, perhaps more than anything, shook me. Much of what I have done since has been a consequence of that exposure. Those months were filled with exploration and amazement, late nights and sweaty taxi rides, desert excursions and an extremely emotional mountain climb. I made friends with students from across the country and from Egypt as well. It was, in hindsight, perhaps the single most critical period in shaping the direction of my life. When I returned to DC for the start of the fall semester that year, I had a deep longing to get back to Egypt. I remember it feeling quite nearly like homesickness, except that Egypt was not yet my home. Sometime that fall, I decided that as soon as I graduated, I would move to Egypt, for at least a while, and see what more there was to learn; this would become the work of my life. I’m completely aware of the naiveté and triteness of these sentiments. But they were sincere and totally honest. For the next week and a half, I visited Hampshire and London with an English friend, who I had met the previous year, and I generally attempted to work up the nerve for what was next. When I landed in Cairo, I began a whirlwind journey that ten years later lead me to the café in which I am writing this post. There is no point in describing here the details of the weeks that followed. I eventually found my footing. I got a job. I learned Arabic. And Egypt went from being a foreign land of curiosity to my home. After six months, I went home for my formal graduation. Everyone thought before I left, that if I made it to this point, my return home for commencement would be the end of the Egypt sojourn. But back I went. Weeks turned into months. Months became years. And now, a decade. Along the way, there have been many transformative events. I do not hope to express them all in detail here. But some were so important to what has transpired and to explaining where I am now that I feel they merit description. I have learned a lot and sharing knowledge is a major part of who I am, so some of this is my hope to impart a bit of that as well. I realize how incredibly self-indulgent this entire exercise is, yet I also feel that as I would have written this for my own personal edification, that it is at least worth sharing. There are so many people that have asked me about my time here, what it is that I am doing and why, and why I continue to stay. For them, this might help to explain. There are many others that do understand. Some of them have been a part of this experience to varying degrees, and for them, I hope they can see a broader picture of the journey in which they have been a part. And for those who read my posts or come across this serendipitously, maybe this will give you a different view of what worlds and opportunities may come about if you take a leap of faith and risk it all. During my first weeks in Egypt, I would regularly buy groceries at a little store on my street in Garden City. There, in the evenings, I slowly struck up a friendship with the elderly owner Aadil. I do not now know why we grew so fond for one another, but with his very few words of English and mine of Arabic, we would spend many evenings in each other’s company. Little by little, Aadil would have me do little jobs around the shop: opening boxes, carrying things for him, dusting the shelves. When things were slow, he would tell me the names of everything in his shop in Arabic. Sometimes, we would just sit, saying nothing, and watch old black-and-white movies on his little television. He would laugh at the shows much more often than I would, but slapstick humor crosses the language barrier and I’d frequently join in. In the months that passed and as my Arabic became functional, Aadil would have me run the shop’s register while he filled customers’ orders. I remain astounded at the trust he unnecessarily placed in me. I have been very fortunate to have many people help and believe in me throughout my life and especially in my youth. But more than any other, Aadil taught me the transformative effect that helping another with kindness and friendship can have. Through a lucky and accidental connection that I made while studying abroad in 2007, I got my first job after my move to Cairo. Teaching English through an embassy program, I eventually came to mentor and befriend one of my students. Over the years that have passed since then, Peter and I have grown closer still. The brotherhood and bond we have formed has been the most important of my life until now. My time in Cairo has been marked by our friendship, and his steadying support and presence have sustained me in the most trying times that have passed. From the start, Peter has had big dreams for his education and future. I have tried my hardest to help those to come to fruition. But while I have shared in that journey with him, he has given me much more. Peter has taught me to be less suspicious and more trusting. He has taught me to have faith in others, and that even if sometimes misplaced, doing so can yield amazing results. Some of my closest friendships and relationships now would never have come about had Peter not pushed me to give others a chance. He has also taught me that forgiveness and persistence are sometimes, although not always, more important than justice and cutting one’s losses. In both, the chances I’ve given others, and him, have given me the greatest joys. Peter has also shared with me his family. From them, I have seen what it means to completely and utterly love others. The joy they share for one another’s company amazes me endlessly and is indescribable without seeing. In spite of my cynicism of religion, his mother has shown me how faith can be transfiguring and sustaining. His father has shown me how intelligence can often look differently given context, and that surroundings often shape the ability of talent to grow. His entire family has shown me how love transgresses culture and language and that to love someone completely is to accept others as they are. Peter’s family has also taught me to appreciate my own. What I have undertaken and where I am would be utterly non-existent if not for the sacrifices, love, and support of my parents. I cannot imagine the stress and anxiety that they faced when Egypt underwent historic turmoil in the years following its January 25th uprising. But they trusted in me completely and have repeatedly accepted that I am better positioned to judge my own safety than their friends and acquaintances who repeatedly tell them to get me back home. Because of that trust, I have witnessed historic and tremendous events. I have been forced to trust in myself against all self-doubt and complete fear, and I have been infinitely rewarded for doing so. But through everything, momentous and mundane, I have always known they have my back. That certainty has been more comforting in continuing this journey than anything else. Whatever I am and have done has been because of them. I have also seen from them and other family members what it means to sacrifice and love. My parents and grandparents have given up countless days and moments with me in order that I be able to follow my own course. This is an immense sacrifice, especially as an only child. But it is truly the measure and extent of their love that they have willingly done so. It is perhaps because of that, and in spite of my distance, that my relationship with them is far greater than that of most of my friends with their own families. I appreciate my parents far more and respect the lives they’ve lived because of the immensity of their belief in me, the love they have shown, and the support they have given. The last ten years has also given me immense gratitude for my grandparents as well. The simple, quiet, and nurturing time I spend with my grandmother is among the most cherished I have. Her kindness, goodness, and love is overwhelming. With her and with one of my grandfathers, I have gotten to explore and appreciate my own family’s history, and in so doing, grown to more greatly appreciate who I am and the experiences and tribulations that others before me have taken in leading to the present moment. My father’s father was ceaselessly inquisitive and one of the brightest minds I have ever encountered. I had opportunities and experiences he could never have fathomed. Yet I got to be his eyes and vicariously share a world he longed to see and experience but never could. He taught me to be appreciative of what I was so fortunate to do and to ask good questions in seeking to know more. The hours he and I spent talking, until his death in 2017, were among the most formative in my intellectual growth. Yet where he had strength of mind till the last, my other grandfather suffered from Alzheimer’s disease culminating in his death this past year. I could see better than most his mental disintegration because of the time elapsing between each time I would see him. But he showed me that love is deeper than a mental faculty, that it exists beyond our knowing of whom we love and why. And in this, Egypt also taught me a great lesson. While in the West we clinicize mental health and seek to categorize all human understanding, experiences in Egypt have helped me to see that his loss of mind was part of a natural process of aging. And far from being a sickness, as so many around him treated it, losing his mind was very human and part of our frail condition. If you’re still with me, there are three last, but major things, Egypt has given and taught me. In the upheaval, and sometimes chaos, that happened during the political and social events of Egypt’s revolution and subsequent reordering, I have learned how absolutely critical it is to keep an historical perspective. That regardless of how tremendous or turbulent a time may seem, it too will pass and life will go on. I think this is especially important for those who see direness in the West’s own political moment. We and the events in which we participate are small in the march of time. This in no way makes them less important. Our world is as it is for the fights we have and have not chosen to fight. But the swift march of time goes on and we with it. There were times during those two turbulent years that I couldn’t imagine life in Cairo would ever return to normal. And now that it has, sometimes I wish it had not. My own realities in Cairo, however, were nothing in comparison to those in the Square to whom it really mattered, to those at home worrying about their children’s futures, and to those who have struggled then and now to support their families in light of the country’s economic realities. I witnessed these events, but in the end, they were not my own. They were an historic moment to which I was a spectator but not really a participant. Watching history in real time and thinking about it in the context of centuries and millennia is one of the greatest opportunities I have had in Cairo. It has shaped how I view history, the role I and others play within it, and the littleness of us all in its scope. Thinking about history is my prime preoccupation. Cairo shaped this more than anything else. Ten years ago, I would never have guessed that I would do first my master’s degree and now my PhD in history. In the early days, my interests in Cairo were nothing more than a hobby. As a child, I loved American history. In college, I sought to read about and know everything I could about the development and evolution of Washington, DC: the city where I lived. In the beginning, my love of Cairene history was nothing more than an extension of these earlier curiosities. But something about Cairo’s history spoke to me. It was in Cairo that I first felt the weight of history as oppressive and suffocating. There are constantly moments where I feel the realness of the past occupying the present. Walking through historic Cairo first brought on these experiences. With so many centuries of continuous occupation, I am always imagining the ghosts of former times as I move through the present. Did they see what I’m seeing? Did they notice that building or cliffside? What did they think about while sitting alongside the Nile? Were they annoyed by the crowdedness of this same market as I am now? Did they stand exactly where I’m standing? These feelings and a desire to sort them out and better understand bygone eras led my budding hobby of learning about history out of curiosity into a full-blown career. These thoughts and feelings preoccupy my time. While Cairo first awakened me to them, I think about them everywhere and always. When I’m in my university town in Germany, I imagine the knights of the landgrave charging up the Rittergasse or the peasants of outlying villages crossing back over the Lahn River homeward bound after a market day. Standing in Sarajevo, layers of the historic past came together in architecture and urban layout yielding a quaint medieval village, a bridge on which an assassin would set off a horrible global war, and the pockmarks of the longest siege of our times. In the harbor of Naples, I could not tear my eyes away from now-peaceful Mt. Vesuvius and imagine the horrors it wrought on those in its shadows. And when at home, in riding through the rural countryside, I think about those who have travelled the same roads as I and most certainly gazed upon the same mountains at the edge of our Cumberland Valley. Cairo cemented my preoccupation with history, and I have been infinitely rewarded for it. My life has taken the course it has taken because of this. Although neither I nor anyone will ever really understand or get to know the past as we would like, the frustrating process of attempting to do so is more than compensating in itself. Finally, Cairo has given me friends and experiences beyond the particulars I have described. I have gotten to share my last ten years with amazing people. Some of whom have come and gone, others remain major forces in my life. With them I have had laughs and beers, cigarettes and late nights, long walks and beach trips, amazing meals and simple sandwiches. They have colored my life, and it is so much the richer because of them. We have laughed over coffees, slept on each other’s shoulders on bus rides, barbecued through teargas, shared in tragedies and celebrated in triumphs. Some of these friends I’ve watched get married, some have passed away. A few I’ve been reunited with in my travels abroad: a late night in Paris, an emotional reunion in Ghent, taking a ferry up the Bosporus, or walking a flat-tired bike through the suburbs of Boston. Others regularly come and go from Cairo and with them we catch up over coffee and reminisce about the past. With one person in particular, I cherish annual book-buying sprees throughout the markets of the city. A few still remain, although fewer and fewer with the passing of time. Among them is the funniest and most generous person I’ve ever met. Another, the smartest and most intellectually curious. These are the people with whom I’ve shared this ten year challenge and who have made it most worthwhile. Cynical me says that Facebook’s ten-year challenge is probably nothing more than a gimmick to help the company recalibrate and improve its facial recognition AI. But I’ve learned to try to be more charitable in my thinking and more generous in my outlook. The outpouring of photos that people are sharing shows that this viral phenomenon, like so many others, has tapped into something real. We like looking back, seeing how we’ve changed, and reflecting on the time in between. Without a 2009/2019 photo comparison, this has been my #tenyearchallenge. Photos would show that I’m balder and chubbier, but what really has changed in ten years cannot be captured in photos and is poorly done in words. This was my attempt at doing so anyways. I love aerial photos, especially from the past, and always try to see how many landmarks I can spot. Oftentimes these aren't buildings that others would consider important, but they have some kind of value to me: an old apartment building, a park, or a place where I like to walk. In Cairo's case, I'm especially interested in placing these landmarks within past contexts. I love looking at how a neighborhood where I visit, have lived, or frequent with friends was once an farm or occupied by a palace where now there is a shopping mall (I'm thinking here about Bostan Mall). I think this comes from the same instinct as looking out of an airplane window and following along with the in-flight map or going up a high building and trying to spot things from a different angle. But for me, as a person who loves the past, it's also about connecting with spaces. While we can't share the same time as those we study or read about, we can share the same physical space. Some of these spaces are supercharged with the past, both personally and historically. There's something eery and off-putting about walking into a room where some strong personal memory occurred and remembering the action of the space. It's the same sensation that comes with running your hand down the bannister of a stairwell and knowing that other people previously have done the same, especially when we know their identities or they are of some kind of significance. I think this attachment to attempting to occupy spaces of some historical or past value is why people often leave unchanged the rooms of a deceased person or why we work so hard to conserve heritage sites. Sometimes these sites are not physically built up as such. Instead, they are simply spaces. A place in which the action of an event occurred. Battlefields are a good example of this, but so are any publicly shared space. These are the places that we mark with an "on this spot..." sign. All of this is to say, I think a lot about spaces, how we occupy them now and in the past, and that an aerial photograph, a map, or an old photo distracts me for hours. The photo that brought about a recent mental side-trip was of present-day, central Cairo in 1904. In it, nearly the entirety of the island of Gazirah and Zamalek are present. Bulaq is viewable from the Imbaba Bridge in the north to the former train tracks just above Egyptian Museum in the south. 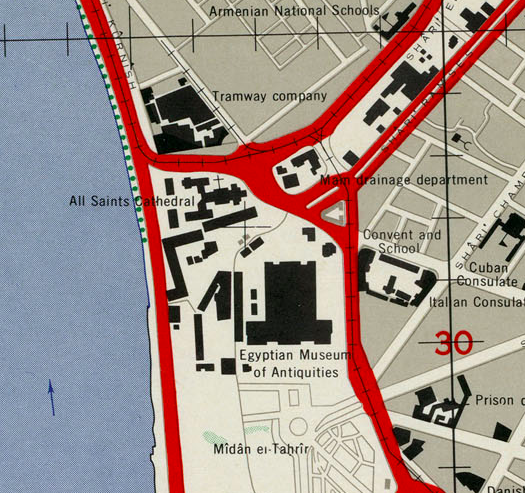 A little glimpse of modern-day Tahrir Square shows us the British military's barracks and the Egyptian Museum; at the very bottom of the barracks the Qasr al-Nil Bridge crosses the river from present-day Tahrir Square to Gazirah. The photo in question, with added landmark names by me. A view of the river, Bulaq, Gazirah, and Tahrir Square from a balloon in 1904 by Swiss photographer Eduard Spelterini. Looking at the photo, many landmarks are visible and easy to identify. Some of the key ones I have marked in the photo above. But when I zoomed in and started moving around the photo, there were three sites/buildings that I didn't know, which stood out, and which I thought might be important. An open field area that appears to be a park or construction site in Zamalek. A long arcaded structure that appeared, and perhaps still does to me, to be an aqueduct in Bulaq. Two villas or other structures behind the Egyptian Museum. After editing the photo to highlight the areas in question, I sent out the following tweet. The first consequence of the tweet was shock at how much interest it raised. It's fun to know that many people, and especially those with whom I'm connected, love looking at old photos and identifying things like I do. Then poured in the responses, questions, resource sharing, and cooperation that has led to the three sites being nearly fully identified. Along the way, however, I learned a lot of new information about places I knew nothing about. What follows, then, is that process. The labelling of the sites was maintained to match my original tweet. I'm discussing them in the following order (C, A, B), because this was the order in which they were "discovered." One of the primary ways in which we (since this was a collaborative effort on the part of many) identified the unidentified sites was by looking through old maps of the city. We had to get as close to 1904 as possible. Going too early, the buildings would be missing; and because of rapid construction at the turn of the 20th century, going too late meant the sites may also have been transformed. The one site that both received the most immediate attention and which was most quickly resolved was Site C: the two buildings to the rear of the Egyptian Museum in Tahrir Square. With the immediate help of AUC's Rare Books Twitter team (I'd love to know who runs their account so superbly), we were able to get a first grasp on the identity of the buildings. Maybe torn down when the flyover was built? This map is superb. One of its great assets is that it has topographical features. If someone is working on GIS mapping of 20th-century Cairo, this would be a great map to use. Secondly, it is the last map that I know of before the rapid changes that occurred in the urban landscape during the following decades. It is very easy to read and a lot of interesting buildings are present. One of the highlights for me was finding the Tomb of Awlad Ṭabataba, which is the last surviving Ikhshidid Monument in Cairo. Back to the Egyptian Museum, the buildings in the photo are clearly present. Unfortunately, while the buildings are present, they remain unmarked. This is the last map that I could find with them. So, as suggested in the tweet above, they were probably torn down in the process of building the 6th of October Bridge and the reorganization of 'Abd al-Muna'am Riyad Square; the loss of the All Saints Cathedral (now a bus stop and flyover) dates to that same time. If someone has an exact date, I'd love to know. This map, however, does not settle the issue of what the buildings were but only confirms their existence in 1958, almost exactly a half of a century after the Spelterini photograph of 1904. It took going through several other maps to find a label. Confounding the situation, this map from the Tanzim Department (1904) does not show the buildings. NY Public Library. Link. 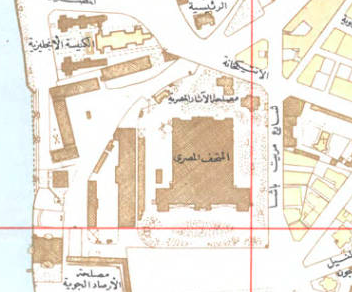 Again unmarked on this map: 1920 General Map of Cairo, Egyptian Survey Authority (مصلحة المساحة). Library of Congress. Link. These two maps, just a selection of the ones which were shared or that I looked at, either do not have the buildings at all or they remain unlabelled. The map on the left from the 1904 Tanzim (Planning) Department map, leaves them off. This map was based on a 1903 department report. As the buildings are missing in 1903 when the report was made but present in 1904 when the buildings are visible in Spelterini's photograph, I'm guessing they were built around that year. But what were they? A tweet and another map yielded the answer. Here they are marked as the Egyptian Antiquities Authority (مصلحة الآار المصرية). Map of the Muhammadan Monuments, 1948, Egyptian Survey Authority. Rare Books and Special Collections, AUC Library. Link. If this is correct, then it does seem that at least some of these planned external buildings were eventually built, including the Director's House and the administrative offices. In some of the photographs and maps, it also looks like some external buildings were eventually built, but they are unlabelled. Thus, based on the maps and this description of the Egyptian Museum's planning, it's safe to say that Site C is definitely the Egyptian Museum's Director's House and Administrative Offices. Detail of Spelterini's 1904 Photograph. Red: Site A; Green: Parks and Clubs; Blue: Gazirah Palace/Present-Day Marriot Hotel; Yellow: Modern streets overlaying those present in photo. Roughly the same view of the modern site. Site A marked in red. Google Maps, 2018. After several conversations in which we (Twitter friends and I) attempted to pinpoint the location, we came to a couple of conclusions: it wasn't the Fish Gardens, as those are visible; it probably wasn't related to the Gazirah Club; and it may have been a construction site, as maps very shortly thereafter show it being occupied. By 1920, the modern neighborhood already was taking shape, albeit with many fewer apartment buildings. 1920 General Map of Cairo, Egyptian Survey Authority (مصلحة المساحة). Library of Congress. Link. Here it is again, more developed, in a 1937 Residential Map of Gezira, Egyptian Survey Authority (مصلحة المساحة). Rare Books and Special Collections, AUC Library. Link. Other maps, from the time period, show the area occupied as a neighborhood as well. It seemed increasingly likely that in 1904 the area was nothing more than a construction site. Case closed. However, a particular Tweep called my attention to the building just across the modern 26th of July thoroughfare. At first, I wasn't really sure, and thought that it was a reference to the St. Joseph's School. 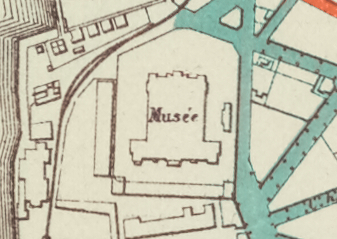 Looking more closely at the 1920 map, the building is very clearly labelled. 1920 General Map of Cairo, Egyptian Survey Authority (مصلحة المساحة). Library of Congress. Link. The Sirdariyya was the headquarters and home of the British Sirdar. This officer was the head of the British military forces in Egypt and the Sudan. His home and headquarters occupied the entire space running from Brazil Street to Shagarat al-Durr Street. In 1936, following the Anglo-Egyptian Treaty, the sirdar moved and the complex was divided into two parts: Anglo-Egyptian Union and the British Officers' Club. The Union became an important part of the elite Cairo scene and its bar and clubroom were important places for the Who's Who of Cairo during the period. By 1952, the political scene having dramatically changed again, the club was converted into the Egyptian Military's Officer Club, as it remains until today. Walking along the northern sidewalk of 26th of July Street now, this is the huge complex walled off from the street and fronted with some shops. (For more information on the Sirdariyya, see Samir Rafaat's popular site: LINK). Google Maps' satellite view shows that much of the property is still intact as it was in the 1920 map. Why is this important for our story beyond being an interesting historical note? One only has to look at what was across the street: Site A. With this in mind, I continued to search the maps. Three maps, of those that I searched, confirm the relationship between the Sirdariyya and the open space of Site A. These two maps, produced by the Italian Catholic order the Combonis, who were originally located on the island, clearly show a camp at Site A. In the second map, the answer is more apparent still: "casernes" which is Italian for barracks. So, the connection between the Sirdariyya and the open space of Site A is clear. The British Military, in addition to having barracks along the Nile at the location of the present-day Ritz Carlton, also had barracks in Zamalek at Site A. The proximity in both cases was to the headquarters of Britain's representatives in Egypt: the Sirdar in Zamalek and the High Commissioner in Qasr al-Dubara (Garden City). 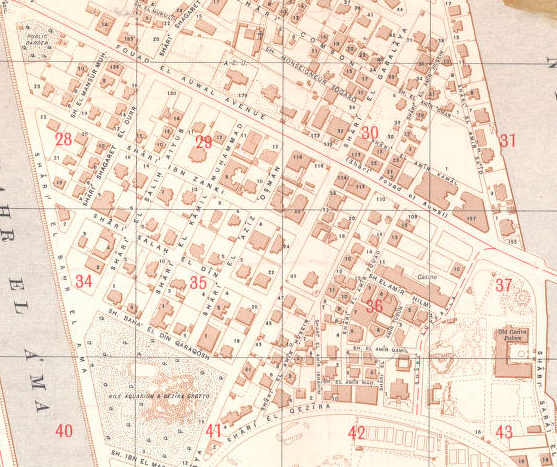 With this knowledge, it became even easier to find the barracks in yet another map: the 1904 Tanzim Map, which I had seen but missed the labelling earlier. Tanzim Department Map of 1904. NY Public Library. Link. 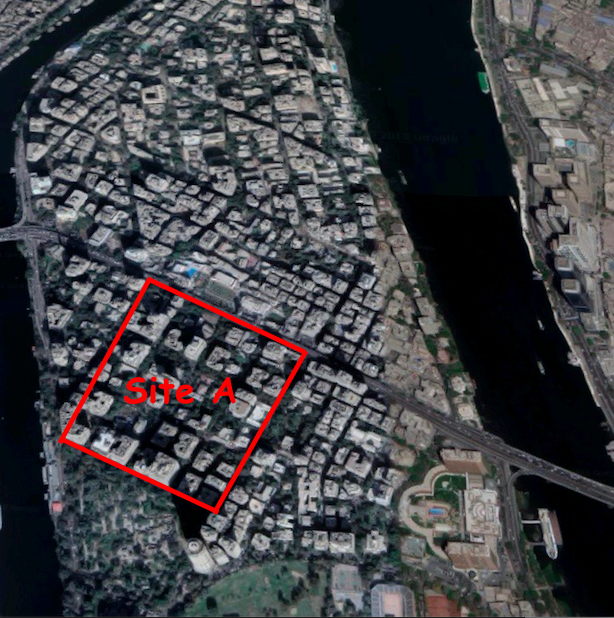 So, Site A is identified: the British Military Barracks in Zamalek. I don't know when exactly these barracks were removed. However, it would seem that soon after the 1904 photograph was taken, the neighborhood was transformed. Judging by the state of the site in the photo and the fact that maps almost immediately thereafter show the neighborhood developed, it would seem the process was already underway. Site B was and remains the most tricky to identify. When I saw the original photo, it looked immediately to me like an aqueduct. Because of a number of my academic interests, I was excited... beyond my current dissertation, I am very much interested in Cairo's food, agriculture, and urban history, which may become a part of a project starting in January 2019... fingers crossed for funding. I knew of only two other aqueducts in city's past. One is the now-immensely-deteriorating aqueduct of Ibn Tulun, which is found in the Basatin neighborhood and can be seen from the Ring Road, if you know where to look. And two, is the very much visible and surviving aqueduct of Sultan al-Ghawri which runs from the present-day Corniche at Fumm al-Khalig (next to Qasr al-'Ayni hospital) all the way to the base of the Citadel near Sayyida Nafisa Square. Bulaq was an incredibly important neighborhood for Cairo from the 15th century. With a port, wharfs, granaries, workshops, trading houses (wakalas), and other commercial structures, it was a major commercial center. Additionally, it was full of gardens, orchards, and plantations. Knowing this, I thought and hoped (still do) that there was a possibility that some sort of aqueduct was built in order to support the neighborhood's residential, commercial, and agricultural activities. If so, maybe Site B was it. Site B: The arched structure running from left (at the river) to right (to the center of the photo. Unlike Sites A and C, there is nothing that I can find that confirms the existence of an aqueduct or points to the identity of this structure. By the time most of the mid-20th-century maps of the city were produced, this area was nearly completed built up. It is now, roughly, the area occupied by the Nile City Towers. Some people had suggested it was related to the Mosque of Sinan Pasha, but unfortunately that mosque is further south. The only thing that Site B may be identified by on a map are a set of workshops in the area. It is not clear to me if these workshops are just slightly more north and if the wall-like structure (indicated by the arrow) is part of the workshop structure. In any case, this does seem to be the structure in question. The issue remains unsettled. However, in looking at other photos from Spelterini. It is clear that Cairo was full of arcaded structures, especially running along streets. Unfortunately, few of these survive, and so they are not part of the urban imagination (at least mine) of the city. Arcades running along Muhammad Ali Street. Some sections of this still remain, especially near 'Attaba. This photo is from another of Spelterini's 1904 aerials. Arcades running along al-Azhar Street. 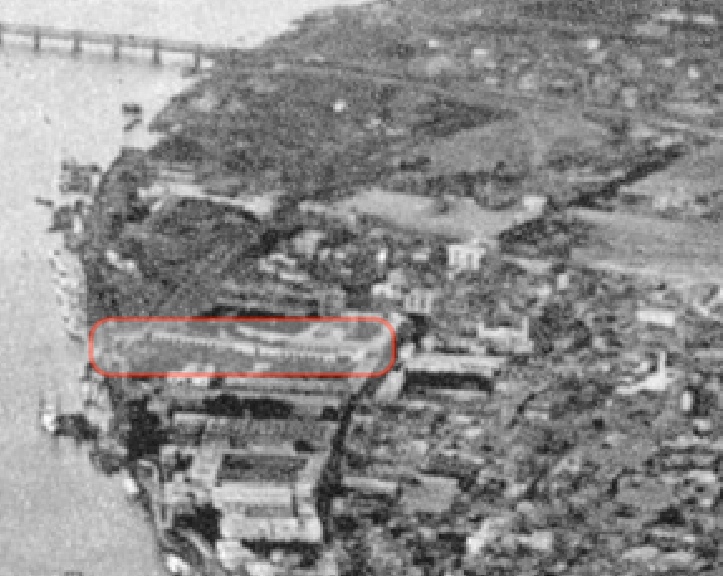 This photo is also from Spelterini's 1904 aerials. I'm still holding out hope that Site B is an aqueduct. That would be a really fun side-project to pursue. If anyone knows of any references to a Bulaq aqueduct, please share. For now, however, I think it is safe to assume it is one of many long-façaded, arcaded structures that were part of the architectural vernacular of the city at the time. Let's say that Site B, then, is only partially and possibly identified. This project was an accident: my curiosity mixed with the miracle of social media and the helpfulness of many people of various backgrounds sharing an interest in Cairo's past. It has been a fun way to learn collaboratively with people that wouldn't have been possible ten years ago. Beyond identifying three structures, I learned a bit more about the British colonial military presence, the evolution of the Zamalek neighborhood, the development of the Egyptian Museum, and the ubiquity of arches in a city that now has so few. I also became acquainted with the map resources that are so helpful in thinking about Cairo's past century and a half. These resources I put together in a Twitter thread, but I intend to make a section of my website dedicated to digitalized resources, maps and otherwise. If you've liked this post, be sure to look for more of these map and photo identification exercises in the future on Twitter, at: https://twitter.com/ATQuickel, leave a comment below, and share with friends. Back to school. View towards the main entrance of the American University in Cairo. Teaching for the first time is an overwhelming experience. Standing on the opposite side of the classroom in a university and being responsible for not only the material that is taught but also the direction in which an entire course proceeds can seem daunting. Having taught various levels of English to different class sizes for a number of years, I thought I was prepared for the experience. Teaching at the university-level, however, was another enterprise altogether. Based on conversations I have had since, I thought it would be useful to write-up a list of "lessons learned" to help other newcomers, especially graduate students, in approaching the adventures of first-time teaching. Background: What follows are a set of tips and suggestions based on my experiences from teaching an entry-level, survey history course at the American University in Cairo during the spring of 2016. That course, "Survey of Arab History," covered the history of the Arab world from just before the coming of Islam until the present moment. I was given fairly free range to make decisions about course content and class design, although my syllabus was checked over by a couple of the department's senior faculty (something you should do, even if it's not required). My class had about 25 students from various levels. You can find a copy of the syllabus, here: SYLLABUS. Be ambitious and set high goals, but also be realistic. There are real constraints on what you can do in one course. If you seek to do too much, time will work against you. That said, be ambitious and strive to reach goals. Even if you don't accomplish everything, the class will be richer for the effort. Although you want to have as much structure and planning as possible at the outset, you have to also leave room for change. Sometimes things don't go as planned, the students are super excited about a topic and want to know more, or simply weather or political events cause a cancellation. Whatever the situation, sometimes you will fall behind or something will happen requiring change. Be flexible and then get back on track. Define objectives in the syllabus for what you want the students to learn and achieve. If you do this first, then you can plan the rest of the class accordingly. As my semester went on, I found it was helpful to read these objectives to myself before organizing my notes and plans for the next class session. Continually returning to the course objectives will help you to stay focused on the task at hand. Ask yourself, "am I meeting the goals I set for the course?". In my case, one of my objectives was for the students to gain exposure to primary source material. As the course moved along, I realized I had been putting less and less emphasis on this objective. Because I continually made mental refreshers of the class objectives, however, I was able to spot the deviation and make an effort to correct the problem. Similarly, it is important to identify key themes which frame the course. In my case, I did this mentally but on a number of occasions lost sight of these main ideas. When this happens, the class sessions start to feel like a collection of separate ideas strung together. Having a few main themes gives a structure to the course and helps to integrate separate classes together making them add up to a larger whole. Having this in the syllabus is very helpful, and rereading these themes before planning lectures can help you to think about where each class's material fits into the bigger picture of the course. Finally, referring back to the themes in class lectures can help the students understand why each class's material matters and how what they are studying is adding up to complete a larger story. Assume that teaching will take a lot of time, then double it - No matter how much time I thought planning, teaching, grading, and readjusting my course material would take, more was required. Teaching a course for the first time, especially as a new teacher, is extremely time-consuming. Things go wrong, plans change, something needs adjusting, students want to meet, grading is monotonous; plan accordingly. If you work by blocking off increments of time in your schedule for different tasks like I do, double the space required for your course. This is especially important during your first weeks of instruction and in allotting time to grading the first exam. On a positive note, this gets better with time and as you develop a rhythm and system. I especially recommend dedicating the time that you are required to use for office hours for completing miscellanea for the class itself. In my experience, students rarely used the office hours, and they were a great time to get things done for the course. Logistics matter - The size of my class fluctuated during the first week of the semester before it finally reached its capacity at twenty-five. Having a classroom that comfortably fits everyone, with enough desk space, was an issue. Our class size did not justify having a bigger room, however students from other classrooms would often take tables and chairs. This meant that my students sometimes were cramped and this was especially a problem on test days. Getting to class early and asking early-arrivers to help in setting up the room and "stealing" back tables and chairs made life a lot easier. But sometimes chairs and tables from other rooms were not available. I don't remember this being an issue in my days as an undergrad in the US, but it certainly was at AUC. In any case, the key take-away is in making certain that the room is appropriate for the class size and that everyone is comfortable. If not, students get distracted more quickly and the class experience diminishes. Arrive early - This should go without saying. But if you are late for class as the instructor, the students will really take liberties with their own arrival time going forward. Plan on being at class at least five to ten minutes early. This gives you a chance to check the number of desks and chairs, ensure that the projector is working, organize your notes, and to be relaxed at the start of class. I also found that this was a great time to chat with students informally, but within the structure of a classroom environment. As a young instructor, this allowed me to maintain a professional space while also getting to know my students. Additionally, if you feel rushed at the start of the class, it will negatively affect your performance. Be there early, and take your time. Additionally, expect that students are on time. At AUC, we take attendance. I found that by doing attendance immediately students feel compelled to arrive on time in order to not be counted absent. Regardless, if you allow students to be a minute or two late at the beginning of the semester, it will turn into ten minutes by the middle. Always defer to the university's policies - It may seem obvious, but check and stick to the university's policies regarding absences, plagiarism, cheating, and grading. You may be able to get away with setting your own rules as an experienced professor, but as a young instructor, it is extremely important that your guidelines match those established by the university. When a problem does arise, having the weight of the university's policies behind you removes a lot of headache, shuts out arguments, and makes life easier. Learn your students' names early on and take an interest - Learning your students' names shows you care about having them in your classroom and makes things easier when associating a graded assignment with the in-class performance of a particular student. I only taught one section with a relatively small class size, and this obviously made the task easier. But when possible, make the effort. Additionally, learning about your students' interest really makes a difference when helping them select research topics and in tailoring class material to the audience. I had a high number of engineering and architecture majors, so when we talked about topics involving art and architecture, I tried to find blueprints of the monuments we were discussing. Similarly, for my political science students, I always tried to tie historical developments with current events and political theory. Relating the material to their interests made a noticeable difference in the interest that the students showed in class. Assume nothing about your students' background knowledge - In an introductory survey class, especially, it is important to assume that the students are coming with no prior knowledge on the topic. Some students may have some background, but everyone will be at different levels. Furthermore, what students think they already know about a topic may not jive with the reality of the course's objectives and themes. Assume that you are starting tabula rasa and proceed from there. Balance proficiency with critical thinking when designing tests - One of the biggest challenges I found in teaching my first course was in designing tests that accurately tested what the students learned alongside how they thought critically about the material. To test proficiency, I made sure to ask questions that had objective and correct/incorrect answers. Knowing who did what, when, and where - the facts of an event - form the foundation of the material that students must know for studying history. Understanding key terminology and testing those definitions is also necessary. That said, it is more important to make sure that students can analyze and think critically about the material they have learned. Short answers and essay questions allowed me to do this. Rereading the course objectives and themes is a good way to think about questions when writing an exam and helps to make sure you are accurately measuring whether students are meeting the benchmarks you set for the course. Finally, when grading the tests, I always made a key in which I wrote down what main points a "perfect" answer would include. By doing this, I was able to gauge how well the student answered a short answer or essay by making sure that they hit the main ideas for which I was looking. PowerPoints and multimedia are great, but don't over-rely on them - I found that using PowerPoints was a great way to include visual aids as well as to keep on target and have a focused lecture. That said, in the beginning of the semester, I used them quite a lot and posted them for the students. If you over-rely on them and make them too accessible, the students quickly learn to wait for your PowerPoints and use them in the place of notes. So use PowerPoints, if it works for you, but sparingly. This same point goes for other forms of multimedia like music and documentaries. I think using other multimedia definitely enlivened my class and the material, but over-using the material takes away from the themes and narratives you are trying to construct throughout the semester. The course belongs to you and the students. Bringing in a third party (music, videos, documentaries, food, etc.) can be helpful but distracts and takes away from the classroom if used in large doses. Not everyone cares - This is an especially hard lesson for people whose whole lives revolve around a certain subject matter. However, it is not just that some students don't care about the material you are teaching, some simply don't care about being a student. Sometimes reaching out to the student can make a difference. Perhaps they are taking subject for the first time and based on preconceived ideas or intimidation with the material, they have pulled back. In this case, a little extra effort on your part might make a difference. Other times, the students just don't care, and there is nothing you can do. One of my students was quite polite but was struggling with the material and seemed to have a bit of trouble with English (almost all of my students were ESL). For a number of classes, I made an effort to pay attention to the student's performance and to talk with him privately after he missed an assignment. After reassurances that things would turn around, nothing changed. I later found out that the student had low grades in all of his coursework, including his major; and I realized that no additional effort on my part would have made the difference. The point is to make an effort, but realize that not everyone cares and live with it. Show unrelenting passion - Regardless of whether students show interest or not, be unrelentingly passionate about your subject matter. Presumedly we all went into academia because we deeply care about what we work on. Show that passion in the classroom and be enthusiastic. The single greatest reward that I received at the end of the semester was hearing from a number of students that my course made them think differently about history and that it was the first time they enjoyed a history class. If you are passionate, it rubs off on the students and changes the dynamic of the class. This is one of the opportunities we have as academics to share our excitement about our field, have fun and you may inspire others to be care too. When you don't know something, say it - There were a few times over the course of the semester that I couldn't answer a student's question, but I always tried to find out. When you're in this situation, be honest, tell them you'll find out, and then do it. Not only is it the right thing to do, but it also shows the student you care about the interest he/she is taking in your course. However, if this happens frequently, you're probably not preparing well enough for class. Reflect regularly; seek feedback - At the end of each class, take time to think about what worked and what didn't. I found it helpful to write these reflections down and then to review them to see if I was making progress. Additionally, seek feedback from the students at regularly intervals. You might not necessarily follow their opinion, but maybe they see something you're missing. I also found it good to talk to the students about what I thought was going well and what we needed to work on as a class. They participated in discussing these issues more than I had assumed. Not only did this exercise help to build trust and communication, but it also let the students know how we were progressing collectively apart from the individual feedback they received from me on their exams and during office hours. Seek a mentor - In my case, I was lucky to have had longstanding relationships with a number of the senior faculty in my department from my days of being a graduate student. Running ideas by those with more experience helped me to wrinkle out and refine some of the things I did in class. Giving them scenarios and asking them what they would do let me see what "best practices" they had developed in their much longer and deeper experiences teaching. If you're not as fortunate to have these kind of relationships, you should actively seek out a mentor. Profiting from their experiences will make your first time teaching richer and more valuable, and it will reflect in the classroom. Finally... Believe in what you are doing and its value. If you don't, why should your students? Standing on the other side of the classroom. My classroom at AUC. After a very long break from blogging, I'm going to be making a serious effort in the coming weeks to get caught up and, more importantly, stay caught up. In doing this, I've decided to do a brief write-up of the Annemarie Schimmel Mamluk Kolleg's Spring School, which was held in Bonn from March 14th to 18th, 2016. The Kolleg itself is designed to advance Mamluk studies by bringing together Mamlukists from around the world to meet and collaborate on various topics related to the field. The center hosts a number of graduate students, fellows, and visiting professors under the leadership of Profs. Stephan Conermann and Bethany Walker. Each year follows a theme; 2016's organizing idea was environmental history in the pre-modern Middle East. In addition to fostering discussion amongst historians, the Kolleg also promotes a multi-disciplinary approach to Middle East history by bringing together archeologists and historians, of various disciplines, in order to create a more holistic view of the Mamluk period, specifically, and Middle Eastern history, generally. It was this interdisciplinary approach that guided the organization of the Kolleg's spring school program. A view inside the library of the Annemarie Schimmel Mamluk Kolleg, Bonn, Germany. Designed as an intensive, one week program of exploring different approaches to the environmental history of the Middle East, the spring school brought together a variety of instructors from various backgrounds. Each instructor, myself included, hosted a day of talks, workshops, and discussions. Using my own day as an example, I chose readings from the Mamluk chronicler al-Maqrīzī and the encyclopedist al-Qalqashāndī for the students to dissect in break-out groups. Coming together, we discussed these texts as a way of looking at the use of traditional Mamluk sources through the lens of environmental history. A write-up by Prof. Bethany Walker about the spring school in the Kolleg's newsletter from April 2016. The spring school took place over five days. Each day was devoted to a separate theme contributing to a larger view of environmental history. On the first day, Prof. Bethany Walker (University of Bonn) opened the spring school by giving an overview of the current state of environmental studies in Middle Eastern history, as well as leading a discussion about the possible ways in which environmental history could be defined. Students had already prepared readings for the day and took part in lively discussions about the topic. As a key note lecture to end the day, Prof. Daniel Martin Varisco (University of Qatar) discussed date palm cultivation in Rasulid Yemen. Particularly interesting to me were the naming of the different palm varieties. With hundreds of names to specify the slightest differences in species, Prof. Varisco showed the intimacy with which local palm cultivators know their trees. Day two featured discussions of Rasulid agricultural texts by Prof. Varisco. One of my first exposures to the Rasulids, we had the opportunity to examine a number of agricultural manuals as well as almanacs from Rasulid Yemen. The almanacs were especially interesting because of the detail with which they recorded astronomical events alongside weather and agricultural data. All of us struggled with some of the more obscure astronomical and agricultural terms used in the month-by-month playbook of planting, sowing, and harvesting. Having not previously seen an almanac, this was a wonderful opportunity. Professor Daniel Martin Varisco leading discussions of one of the Rasulid texts examined during a breakout session. On the third day of the spring school, I led breakouts and discussions (as mentioned above) of a number of Mamluk texts that could be used for better understanding the environmental history of the period. These included the soil categories used by the Mamluk regime, which were presented in al-Maqrīzī and al-Qalqashāndī. Additionally, we looked at al-Qalqashāndī's listings of the various plants, animals (domesticated as well as wild birds and fish), and crops available throughout Egypt during the period. Using the same sections from al-Qalqashāndī, we also saw how these texts could tell us about waterbodies, mountains and geology, as well as other environmental elements of the Egyptian landscape. Finally, our group looked at al-Maqrīzī's discussion of the various markets in Cairo with an eye towards the food markets of the city. By doing this, I hoped the students would see how crops actually appeared in the market to the consumer and understand the ways in which Cairenes most directly interacted with their environment: by eating it. Prof. Yossef Rapoport discussing al-Nabulsī's Tarīkh al-Fayyūm. On day four, Prof. Yossef Rapoport (Queen Mary, University of London) guided our group through the Ayyubid text of al-Nabulsī: Tarīkh al-Fayyum. Written as an administrative guide for the Fayyum, al-Nabulsī's text presents amazing details about the makeup of villages, agricultural production, and taxes. Looking at the text, Prof. Rapoport showed how an incredible amount of data could be mined from the source and how this information could be used to reconstruct a portrait of the environmental, social, and administrative history of the Fayyum in the late Ayyubid period. I found it particularly interesting that various tribes were connected to specific economic activities and geographic areas of the Fayyum. These tribes organized the life of the region, and they were also critical in ensuring fair water distribution. In combination to an earlier talk I attended by Prof. Rapoport (interestingly entitled, "Counting Sheep in the Fayyum"), I walked away with a much better idea of al-Nabulsī's work as a source to which I hope to eventually turn. Prof. Corbino showing various animal remain specimens to the group for identification. The class examined specimens from the collection of the Alexander Koenig Zoological Museum in Bonn. The final day of the spring school was dedicated to using plant and animal remains, uncovered by archeology, as a source for environmental history. The day was led by Prof. Chiara Corbino (Sheffield University) and Annette Hansen (University of Groningen). Prof. Corbino led the group through the various ways in which animal remains are identified and then discussed the implications of that information for understanding an archeological site. This was particularly interesting to me as Prof. Corbino's discussion showed the really practical connections that could be made between archeological evidence of animal remains and how archeologists and historians could apply this to reconstructing life at a site. For example, if a cow was young when it was slaughtered, it was probably eaten by people of a higher socio-economic stratum. (Bone size and joint fusing can be used to indicate age; knife marks, evidence of cooking, etc can show how the animal was killed). In contrast, the poorer inhabitants of a site would have used the animal for manual labor (also indicated in the bone record) and exhausted the practicality of the animal before slaughtering it for food. At one of the sites that Prof. Corbino excavated, younger, slaughtered animal remains were found in a high concentration around the citadel of the site, where the elite would have lived and eaten. Elsewhere, where mostly peasant and common people lived, older, worked animal remains were found in high concentration. By giving this example, amongst many others, Prof. Corbino showed how archeology can be valuable to historians as they try to imagine the occupation of a site, and this really cemented one of the overall goals of the spring school: fostering interdisciplinary approaches to history. Alongside Prof. Corbino, Annette Hansen (doctoral candidate at the University of Groningen) taught the group about the botanical side of archeological sites. Looking at the remains of various plants, wild and domestic, Hansen showed us how these remains could help us understand the nature of agriculture, diets, and other aspects in the lives of a site's inhabitants. Furthermore, she showed us the painstaking work of counting and sorting the various parts of a plant in order to create a quantifiable listing of the prevalence of the different species present. Complementing Prof. Corbini's animal-oriented approach, Hansen's presentation was extremely valuable in showing the actual evidence of the agricultural practices that we as historians read about in textual sources. Annette Hansen discussing the process of sorting plant remains at an archeological site. Unfortunately this post is a lot less informative and detailed than it would have been had I began writing this in March. However, my goal is to give an overview of the spring school that I hope might pique a reader's interest to find out more about one of the instructors, their work, the Annemarie Schimmel Kolleg, or environmental history generally. Hopefully as I catch up, my posts will be much more informative. Panorama from my living room. I'm a little late in getting back into the swing of blogging and posting regularly. This past month and a half has been quite a whirlwind. However, I'm going to endeavor to catch up in this and the coming post, and then to remain caught up as I move into the winter. This past October, I spent five weeks in Cairo to begin laying the foundations for my upcoming research project. I had really been hoping to immediately begin at the Egyptian National Archives (دار الوثائق المصرية), however when I arrived my permissions from the archives were still being processed. I had applied for permission to view the archive's collections of Ottoman court records (sijjilāt, سجلات) in June, and I had expected that four months would have been sufficient to process my requests. Unfortunately, it was not, and I had to make several trips to the archives to push the process along before finally getting both my permission and my carnet for access to the research hall (قاعة البحث). In this room, there are a number of computers for viewing digital collections and microfiche, and the staff pulls requested materials for viewing. Altogether, the process is fairly efficient. Now that all of the administrative processes have been finished, I intend to hit the ground running when I return at the end of January. For those interested and intending to visit the archives and library themselves, you should be aware that there are several facilities that handle various portions of the archives collections. The main collections of both the National Library and Archives is on the Nile Corniche in Bulaq, just north of the Conrad Hilton and the Cairo World Trade Center. Here on the left side of the complex, you can find the National Library (دار الكتب). On the right side, there is a ground floor entrance into the National Archives. Most of Egypt's archival material can be found here. Another branch of the National Archives can be found in Bab al-Khalq in the same structure as the Museum of Islamic Art. At this location, there are primarily manuscripts, as well as the Thesaurus Islamicus Project, see: http://www.thesaurus-islamicus.li/index.htm. Additionally, Egypt has built, but not opened, a new location for the archives near Fustat. When this new center will open, I don't yet know. However, I'm hoping that it won't happen during the course of my research, as the collections will certainly be inaccessible during the move. Hopefully, I'll do an upcoming post, or even a separate section to my website, about libraries and research collections throughout the city that would be useful for researchers on a variety of topics. The other part of my time in Egypt was spent in the library of the IFAO (French Institute of Oriental Archeology). This Institute has a magnificent library with more than twenty rooms overflowing with texts related to various topics of Egypt’s history, specifically, and the Middle East, generally. While the majority of works, however, are focused on the archeological study of Egypt and, therefore, are centered on the antique past, i.e. the Pharaohnic, Hellenistic, and Byzantine periods. However, the library does have a number of rooms dedicated to the Islamic period. Familiarizing myself with these collections and trying to lay a framework for my secondary research were the primary focuses of my time at the IFAO. The IFAO’s library is primarily accessed through request. On the second floor of the Institute, you can find the main reading room, and materials may be requested through the librarians. For some researchers, permission can be given to gain full access to the library. In doing so, you can pull materials yourself and browse at your own leisure. All books must remain within the library. In my next post, I’ll give an update about our research team’s first workshop in Marburg, as well as a few others of my activities upon my return to Germany. Also, I’m hoping through the winter to post some more substantive discussions about my actual research project and the direction it’s beginning to take. Stand by!